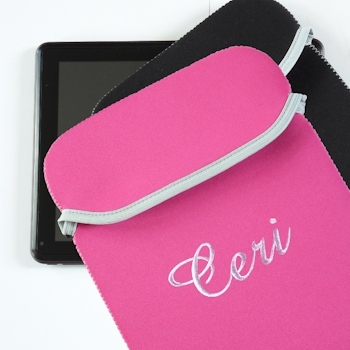 iPad and tablet sleeve cover made from cushioned bright pink neoprene with graphite trim. iPad and tablet sleeve cover made from cushioned bright pink neoprene with graphite trim. Soft cushioned sleeve with Velcro fastening fold over closure. Embroidered with a name, nickname, word, or initials of your choice. iPad and tablet sleeve cover made from cushioned bright pink neoprene with graphite trim. Soft cushioned sleeve with Velcro fastening fold over closure. Embroidered with a name, nickname, word, or initials of your choice. This cover measures 18cm wide by 24cm length.